Create delicious vegan meals quickly with this handy on-the-go recipe book that makes eating away from home fun and easy. Eat vegan anytime, anywhere with Vegan on the Go. With over 100 nutritious recipes and healthy lunch ideas, your desk lunch will never be sad again. 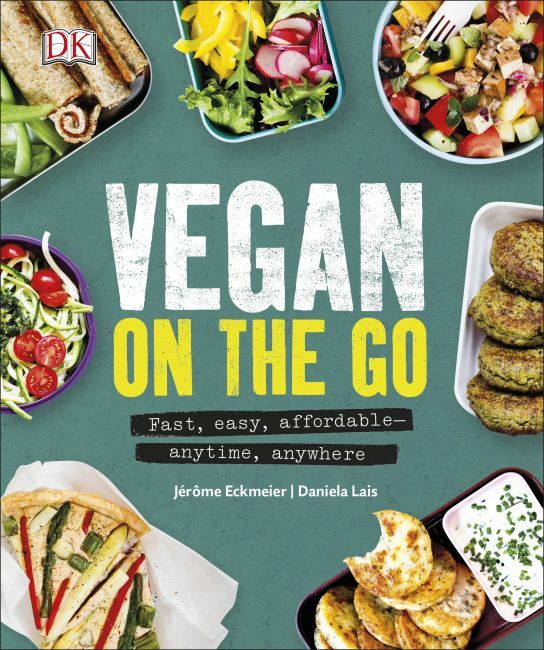 Eat vegan snacks, soups, salads, sandwiches, hearty mains, and desserts with meals created by vegan authors Jérôme Eckmeier and Daniela Lais. Vegan is more than just salads. Try out simple and super-convenient recipes for quinoa chili, soba noodle summer rolls, chia and almond pizza, and vegan hot dogs. Plus, satisfy your sweet tooth with delicious vegan desserts, including fruity macadamia nut cream, and chocolate mini cakes. Vegan on the Go arms you with a list of ingredients to stock in your kitchen so that you can prepare and pack meals easily. With transportation tips and tricks, your meals will stay fresh and they won't get soggy. Know exactly how long prep and cook time will take to make each meal, and the clear photographs show off exactly what the final product should look like. A little preparation goes a long way to creating amazing and vibrant vegan meals. Eat your fill with Vegan on the Go.